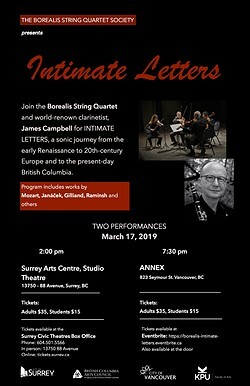 Exploring the intimacy of chamber music, INTIMATE LETTERS takes a sonic journey from the early Renaissance to 20th-century Europe and to the present-day British Columbia. World-renown clarinetist, James Campbell joins the Borealis String Quartet for an intimate chamber music experience featuring Mozart's sublime Clarinet Quintet. Also to be performed are Janáček's passionate String Quartet No. 2, Intimate Letters, his "manifesto on love" and a wonderful jazz-inspired clarinet quintet by Canadian composer Allan Gilliand written especially for James Campbell. Rounding out the concert will be some early Renaissance works by Victoria and Palestrina as well as a string quartet by Canadian composer and recent Order of Canada recipient, Imant Raminsh.